SS CHaD Express LLC was started in June 2003. Fritz Krampe had a passion for trucking and owning his own business. The time was right to do so. With just 1 customer and 1 truck, the trucking adventure started. Soon, there was a need to add another truck and a couple trailers. As time went on it has grown from a small start at the beginning to 13 tractors, 25 dry van trailers, 3 curtain side flats, 3 hoppers and 1 flatbed. We have local manufacturers that we provide service as well as customers throughout the Midwest. We also work with a local distribution/warehouse center and provide contract carrier service for them. Our hopper division was added in 2014 as the need arose with a regular customer. The hopper division provides service to feed mills within a 200 mile radius. Offering services to the Midwest since 2003. 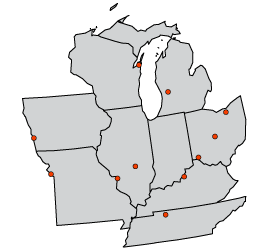 We provide service to 26 Midwestern states but primarily run 300 mile radius of central Illinois. We are in Chicago and outlying areas on a daily basis. We utilize food grade 53 ft dry van trailers with air ride and swing doors. Most tractors are sleeper trucks with a couple daycabs. Curtainsides are 48 ft X 102 in, air ride & swing doors. They work great for lumber, and equipment, etc. We also utilize tall sided hoppers for maximum capacity.